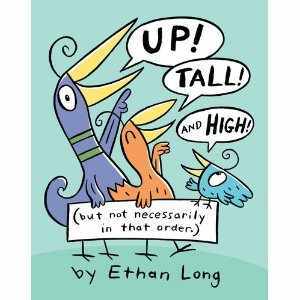 I've looked at a couple other Ethan Long books before and they never quite worked for me. The Croaky Pokey is a very popular storytime read, but his other easy reader/picture book Bird and Birdie I really didn't like. So I was surprised when I fell in love with this odd and simple easy reader. A group of brightly colored birds of various sizes introduce three concepts. In the first chapter, I Am Tall, three birds of different sizes compare their height. In the second chapter, I Can Go High, three birds test their flight abilities and help out a friend. In the third chapter, I Am Up, a bird tries to join his friend with disastrous consequences. Each story is told very simply through basic dialogue. The art and surprise flaps at the end of each story carry the plot. The dialogue of the first story, for example, is basically the different birds saying "I am tall." Kids will have to extrapolate from the pictures and expressions of the birds that there's more to the story than what the birds are saying. Of course, it's inevitable that Long will be compared to Willems. While the birds in this story don't have the instant attraction and heart of Elephant and Piggie, they do have the same comic timing and "less is more" artistic sensibility. The flaps should be long-lasting as the paper is very thick and sturdy, with an nice glossy finish. Verdict: This is a good choice for insatiable Mo Willems fans who just can't get enough and for parents looking for easy readers with only a few words on each page, in large type. Recommended. Babysitting and bagging groceries are the only jobs in our small, quasi-rural community for teens (unless you're one of the couple very lucky ones I hire as my assistants!) and I'm always looking for books that will encourage teens to DO things - including building skills like babysitting. We've got a couple babysitting handbooks already; some aimed at younger teens, some general, comprehensive ones that include everything up to the kitchen sink (along with 25 games to play with the kitchen sink). So why buy another babysitting for teens book? The beauty of this little volume is that it's comprehensive while still being a quick guide. The three sections, Babysitting Breakdown, Essential Skills, and Business Basics, cover everything from child development to getting sick to how much to charge and they do it all in only 127 pages. This is the perfect quick guide to hand to a teen interested in getting a babysitting business going or needing an immediate refresher before they start babysitting in a couple hours. The book begins with a quick rundown on basic types of babysitting and what different ages will need. It's also honest about the difficulties and potential gross factors, but also about the rewards and good experiences. Essential skills helps teens get organized, know what to ask parents, deal with emergencies, discipline problems, and health issues. The business section talks about finding, keeping, or quitting jobs as well as acting professionally and babysitting as a business. This book is geared more towards older teens and nanny-type babysitting - dealing with illness, taking kids to after school events, helping with homework, long-term babysitting, etc. rather than just taking care of kids while the parents have an evening out. The tone is also more sophisticated and the style seems geared towards an older audience (in the legal section one of the things it says not to do which would endanger children is "show up intoxicated") so this will probably be most appreciated by older teens who want to babysit as a regular business. 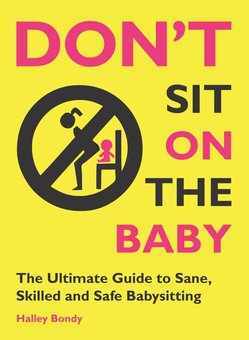 Verdict: While younger kids will probably be better off with one of the more casual, babysitting for a couple hours in the evening and getting started guides like American Girl's guide, Don't sit on the baby is an excellent book for older teens looking to babysit as a regular business. I'd recommend purchasing this title to meet the needs of older teens and more serious babysitters along with Heidi Murkoff's What to expect baby-sitter's handbook for additional information. Recommended. This week at the library; or, Vacation, really? I finished all the publicity on Monday and Tuesday. Yay me! Except the giant posterboard I need to take to the summer school (after I use it at the grocery store). But that's mostly done. I do need to make the jpegs for our new tv screen less wordy, but I am NOT rewriting them (did you hear that Angela? NOT). I also got most of the supply orders sent, although I still need a trip to Walmart, and various other random items. Handled a major hitch in the summer reading log printing, which ended up with me going to the printers around 8am on Wednesday, then back to the library, then a very large final storytime at 10am, then I cleaned off my desk (it was covered in four foot piles and boxes. remarks were being made) then a small Messy Art Club to make kites. So far I have used my vacation to: Redo my blog, various bits of shopping, plants some pots, and Saturday I'm going to Ikea. Full disclosure: I won Summer Camp Science Mysteries on Lerner's Free Book Friday. But I had already decided to review the first volume and buy it for the library before I won them. Just so you know. Angie and Alex Rayez have second thoughts about Camp Dakota when they see how creepy it looks in the fog. They soon find out there's even more to worry about - when Braelin Walker tells them about the fog zombie. His older brother, Rashawn, doesn't believe it and neither does camp counselor Kyle, but Angie and Alex are soon investigating along with their new friends. 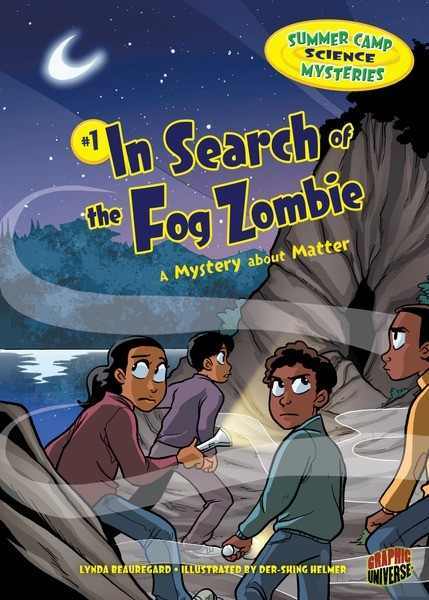 After some chills and thrills, they discover the real fog zombie - and some interesting science. The book is full of science factoids and various characters stop what they're doing to lecture on matter or show an experiment and the mystery itself is solved through logic and science clues. The plot outside the science is a little thin, mostly because of the number of characters. Kyle Reed and Loraine Sanders are apparently camp counselors - at one point one of the kids says Loraine is "another counselor" but no other adults are in evidence and Kyle punishes Loraine for her part in the mystery at the end. We never find out why Jordan Collins is so blah about everything, although that could just be his personality. I thought it was interesting that while four of the six children were non-white races and had dark skin, both of the counselors were white. There are additional science experiments at the back as well as "mysterious words" i.e. a glossary, a list of the scientific facts about matter included in the book and a note on the author and illustrators. The illustrations are crisp and clear and reminded me a lot of Raina Telgemeier's style - big, expressive eyes and faces and well-drawn settings. The text was an easy to read type and big enough for an intermediate reader. 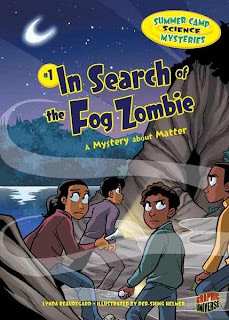 Verdict: While the book leans a bit heavily on the fact-dumping for my personal taste, this is exactly what a lot of kids who like science mysteries will adore. Just enough plot and character to carry the science along with cool experiments and some funny moments. The art is also attractive and the text readable. However, at only 50 pages it's hard to justify this in a budget the size of mine and I don't think this is really worth the $25 price tag, BUT Lerner's paperbacks are pretty sturdy so I'd recommend purchasing the paperbacks. Why yes, I am cleaning out my to be reviewed list. This was one of my favorite discoveries a few years ago. An Australian import, it's a delightful story in swinging rhyme with equally entrancing pictures. A happy band of rabbits are gulping down carrots and chocolate cake by the lake (really more a big pond) when suddenly...there's a TERRIBLE PLOP! Their panic sets off a mass flight and soon the rabbits, a fox, pig, elephant, tiger, and more are all fleeing from the terrible plop. Then they encounter a rather cynical bear, who doesn't think anything, even a terrible plop, is as strong and scary as him! 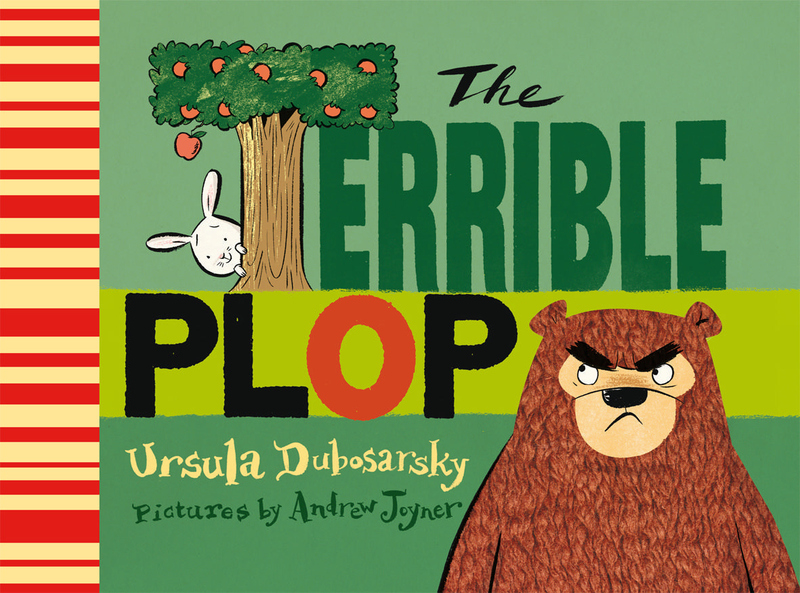 This time, a little rabbit realizes the secret of the plop - but not until the bear has been just as silly as everyone else! The clues in the text and pictures will easily key children in to the solution of the mystery at the beginning of the book, so they'll be able to snicker along as all the animals flee from nothing much at all. Andrew Joyner's are just plain fun with cartoon animals and backgrounds and the occasional grab your eye collage piece, like an elaborate knife for the chocolate cake. He does a great job adding hints to the text about the mystery and showing the growing panic of the various animals. Verdict: A fun story with a moral about confronting your fears that's not too heavily emphasized. This is a favorite storytime choice for my library as well as a top read-aloud pick for parents. I've put off a review of this book for over a year because I couldn't decide how to write it in such a way to convey how amazing this story is. I will start by saying that I am now completely fascinated by bears and the Northwest coastal area. This is the story of the Great Bear Rainforest, a coastal temperate rainforest on the west coast of British Columbia that is home to First Nations people, an amazing variety of animal and plant life, and bears. Grizzly bears, American black bears, and spirit bears, a rare species of black bears. In loving detail, photographs, and lush language, McAllister and Read describe the beauties of the Great Bear Rainforest and the bears that live there; the amazing discoveries that have been made about these mysterious animals, the wilderness that still remains to be explored, and how the bears have adapted to their special environment. The book is divided into the four seasons and the reader follows the bears through the cycle of the seasons and their lives as they hunt for different kinds of food, mate, give birth, and raise their cubs, face enemies, and survive in their natural habitat. The final chapter talks about the threats faced by the bears and the rainforest - only a small part of the forest is protected and logging and other industrial activities endanger the area while trophy hunting endangers the bears themselves. 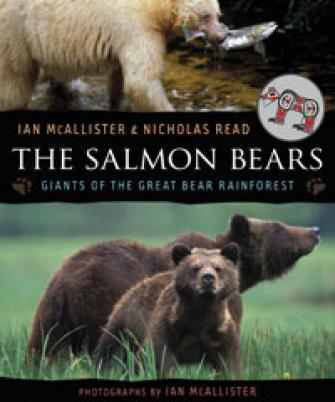 The authors recognize the varied concerns but are clearly on the side of the bears and the wonders of the rainforest. Suggestions of places to go to help and an index complete the book. Verdict: The amount of text will be daunting to reluctant readers, but many middle grade children will find this a fascinating and eye-opening read, as will adults! Highly recommended. Very small group at our last Lego Club of the spring session. I expect attendance to go up in the summer and hope that changing the day won't kill the program. The chicks went to the farm. Thankfully. They're only cute the first couple days. Two weeks was waaaay too long. Testing the new front desk - I'm not really comfortable there and will be glad when I have the schedule ironed out and I can settle back in the children's area with only my evening, weekend, and occasional shifts at the front. Saw the teens on the security camera batting a balloon back and forth. That's an awfully thin balloon..with a weird protuberance...oh heck! Hasty dash upstairs, confiscation of *cough* "balloon". Big thank you card from all the elementary schools for hosting Battle of the Books. This review could be subtitled: Why backlists are cool! I discovered this book over a year after it had been published, and then it sat in my to review pile for another year after that - but it is still AMAZING. The giant grotesque lizards! The dead rats! Fifteen year olds playing with giant lizards! There are several threads woven into this nonfiction title. 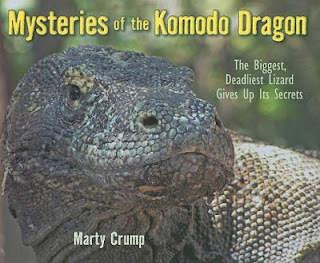 There are the facts and life of Komodo dragons, there is the research of the Auffenberg family in 1969, and there is the current study of these fascinating reptiles. From 1969 to 1970, the Auffenbergs, including their fifteen year old son Kurt and a university student from Bali, Putra Sastrawan, studied Komodo dragons. The story leads up to the Auffenbergs' research with the history of dragon study until they became endangered in the 1960s. 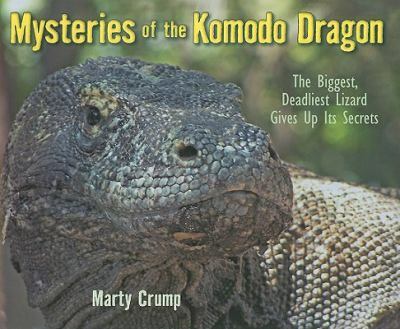 But the study of Komodo dragons isn't finished; new, amazing facts and abilities came to light in the 1990s and in 2006 and scientists and zookeepers are learning more every day about these strange reptiles. Additional information includes brief facts about Indonesia, the Komodo dragon life cycle, sense of smell, conservation status, and the Komodo Survival Program. There is an extensive bibliography, glossary, further reading, and index. Verdict: This book may be a few years old, but it's fresh and new! Kids will be awed by the amazing facts and photos and the text is simple enough for most middle grade readers. Recommended. I am so excited! Ozma of Oz made it onto Fuse #8's Top 100 Children's Novels!!! Break out the dinner pails and pick some lunch boxes! I giggled all the way through - as did the two librarians I was reading it to. 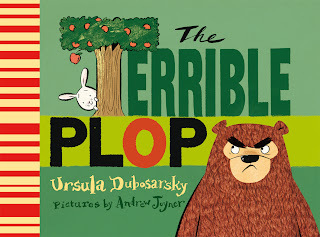 Generally, graphic novel picture books are hard to read aloud, but this book perfectly blends the visual and text to create a silly story that will keep small children and adults snickering all the way through. Bah the goat, who never says anything but "bah!" gets up one morning, and finds a sock in front of his trashcan. He takes it down to his friend, Beep the robot, who never stops talking. Beep knows just what to do, "We must find its match!" and immediately they set off. "Do you smell that, Bah? That, my friend, is the smell of adventure. or it could be this sock. Hard to say, seeing that I don't have a...nose." says Beep. As they go up and down hills in a Seussian landscape, They meet an array of square farm animals, including a pig, chicken, ox, cow and more. They encounter quicksand, meteors, and travel underwater. No matter what happens, Beep is always enthusiastic, always ready to translate animal sounds, and always enthusiastic. When their journey is over, they may not have found the other sock (or have they?) but they certainly had an adventure! The perfect comedic timing of art and text is a large part of what makes this so funny. 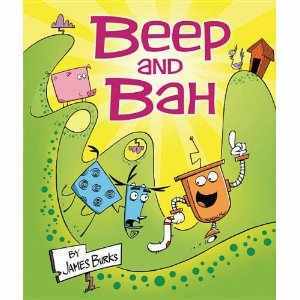 As they encounter various animals, Beep's optimistic approach to their baas and clucks will spark off endless giggles as they contrast with the sometimes unexpected events. Verdict: Read this in storytime to a variety of ages, take it on school visits, and listen to the laughter explode. Highly recommended. ISBN: 9780761365679; Published January 2012 by Carolrhoda; Borrowed from the library; Purchased for the library. 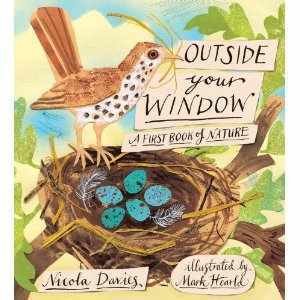 I am always looking for books that will encourage kids to go outside and experience nature. I'm also always searching for books that will inspire kids to choose something they feel passionate about. I get frustrated to the point of screaming by the number of aimless children, especially middle schoolers, that I see every day. They have no hobbies, no interests outside of tv, celebrities, school gossips. They don't get excited about anything. This book combines a love of nature with the intense following of passion and it's AMAZING. 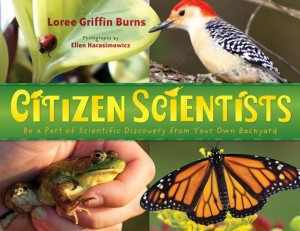 Loree Burns, author of several great entries in the Scientists in the Field series, tackles four science projects that ordinary citizens - and kids - can get involved in; birds, butterflies, frogs, and ladybugs. We learn the history of the project, why it's important, how to participate, and hear the stories of some of the kids who are involved. Every page is studded with photos, facts, experiences, ideas, and information. At the end of the book there are resources for each of the four projects - books, field guides, internet resources, and how to get involved. There's additional resources and bibliographies, a glossary, and index as well. Verdict: An exciting and interesting book, I intend for this to be the basis of some great science projects in 2014 when the summer reading theme is science! I can't wait to get the kids involved and I hope reading this book will get some of them involved on their own. I just love the way that sounds. WaaaaPL. WAPllll. WAPlll. Monday - Computers were completely haywire, one of the chicks died, I arrived 30 minutes early to set up our Children's Book Week program (total stealth program - people write titles of books on a bulletin board and get a sticker and we try to make it up to 1,000 books), I went through applications for my summer temp aide, organized and sent my May book order, cleaned a ton of donations off my desk, helped people with the copier, put out new books, went over summer displays, and updated publicity, all before 2:30pm at which time I went home because A. I had forgotten to bring any lunch and B. I am working on Saturday. Called people for interviews when I got home, went to pick up comics for the library, realized I had forgotten the petty cash, and applied for an ALSC committee. Tuesday - Came in a little later (again, working Saturday) and set up a Maurice Sendak display. Worked on publicity and book bundles. I cannot keep up, they are so popular! Wednesday - Storytime, had some problems with chatty moms which I will deal with...later. More book bundles. Lakeland School visited and we read stories, played with the trains, and looked at the chicks. I talked to the teacher about changes we'll need to make next year when she will have some nonverbal children and some who need more structure. More book bundles. Messy Art Club with twirling ladybugs, which I used in storytime a few weeks ago and originally got from Make and Takes. Once it was well started, I left it in the hands of my aide and took off with our adult svs librarian and cataloger on the three hour drive for WAPL. Thursday - I convinced my colleagues to skip the keynote (shoes vs. copyright - no contest, even though I hate shoe shopping. Besides, her shoe was BROKEN. It was an emergency!) Then the sessions started! I went to an AWESOME session on Exploration Station with Ashley Thiem-Menning from Appleton. Exactly what I needed to get started on the planning for my We Explore program in the fall and to revitalize my Messy Art Club. I skipped the luncheon speaker to check out the nearby bookstore (yeah, I don't do well with featured speakers). Then I went to a session on Technology with Kids and Teens - got an idea for an inexpensive media room. I attended a session on Easy and Fun Crafts to do with Adults by Annie Bahringer from Port Washington - best use of PowerPoint in the whole conference I think! I covered this one for our adults svs librarian. Then we visited a huge craft outlet/warehouse (new yarn!) and went for a long walk. Friday - Our cataloger and I talked the adult svs librarian into getting up very early to go fudging! Alas, we were bitterly disappointed to discover that the promised fudge was no longer sold at the advertised venue. However, despite the lack of fudge, it was another awesome day since it started with a session on Stealth Programming with Amanda Struckmeyer and Marge Loch-Wouters. I am all revved up to do 1,000 Books Before Kindergarten this fall now and the ideas flowed vigorously! I thought Ashley Thiem-Menning's presentation yesterday was so great, I changed my plans and went to her second presentation on Taking Your Summer Library Program on the Road along with another Appleton librarian, Ellen Jepson. I can't do much with outreach of course, since there is only one of me, but I was really interested in their summer reading program for daycares which I think is something I could implement in the future. I'm very excited about this new beginning chapter book series. It has so many elements I've been looking for! The story: EllRay is the smallest kid in third grade and two of the biggest boys are picking on him. Why? He doesn't know. He also likes to make people laugh and it's getting him in trouble in school. So, his dad makes a deal - behave for a week and he'll get to go to Disneyland. This turns out to be as hard as EllRay thinks it will probably be, but he manages it in the end and even has a temporary truce with the bully, Jared. I've been frustrated for a long time by the lack of minorities in everyday fiction. Not high concept, not celebrating culture, not historical, and not stereotyped settings. Not every Hispanic kid is a migrant worker. Not every African-American lives in a poor urban area. 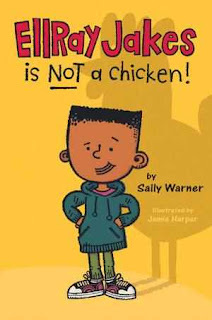 This is exactly the kind of character that the kids in my predominantly white, small Midwestern town will read about - because it's focused on people, not their race or culture, and whether the kids are a minority or not they can relate to EllRay who has identifiable problems. His race isn't ignored - he wishes there were more kids who looked like him "just so it would come out even" and it's a sensitive point for his dad and the other adults who are worried that he's getting bullied because of it, but Ellray knows that's not the point "Jared would have said something if it was. He is not the type of kid to keep things to himself. That much is obvious. Anyway, there are plenty of other things that could make him want to pick on me." There's a lesson to be learned by EllRay of course - that words can hurt as much as punches and his jokes have repercussions. EllRay and his little sister both think and talk about kids' interactions in school - the way girls are often mean to each other and how it's different than the way boys are mean and how sometimes you're friends one week and not friends the next. The adults mean well, but as EllRay points out "outside is when school really happens for kids." The adults' interference sometimes helps, but sometimes causes more problems and in the end the kids have to figure it out on their own and it's not easy. Verdict: This new series is funny with some good points for thought. Parents might be uncomfortable with the kids resolving their issues with a fight - but it's a realistic portrayal of how kids relate to each other and they can use it to discuss ways kids can resolve their issues on their own. We've had this series for about three months now and it's very popular! Highly recommended. This sequel worked much better for me than the first book, Chicken Dance. I thought the first one was hilarious and would be great in storytime, but it turned out I wasn't the only one who missed the pop culture references and most of the kids just didn't get it. I think this one will work much better. Marge and Lola, having won a talent contest in the previous book (recapped in photos on the title page) are off on tour with Elvis Poultry! At their first stop, McDoodle's Barnyard however, Marge and Lola freeze up. They try everything, but nothing works and they flop at barnyard after barnyard. They're about to be sent home when they remember what's most important and know just what they're missing and on their next stop at Dale's Dairy Farm, they moooove the cows - and Elvis Poultry too. In glorious technicolor with sparkles everywhere they can be put, the chickens faint, flop and finally dazzle their way through this silly romp with a gentle reminder that performers need friends and fans too. Dan Santat's chickens and other barnyard animals are delightfully blocky and exuberant and the design of the book makes all the jokes moooove perfectly. Sy Montgomery, author of a number of great entries in the Scientists in the Field series, brings to life an amazing, unique woman for middle grade readers. Temple Grandin embraced the differences that made her childhood and teenage life so difficult to become a major influence on the livestock industry, an expert in animal behavior, an engineer, and a professor. She also advocates for autistic people, writes, speaks, and enjoys life. Her philosophy is not that she triumphed over her differences - those differences are what made her able to become the person she is and make a difference in the lives of humans and animals. After an introduction by Temple Grandin, Montgomery plunges into her early life and explains what it's like to be autistic and try to survive in a world of sensations where you can't easily communicate. 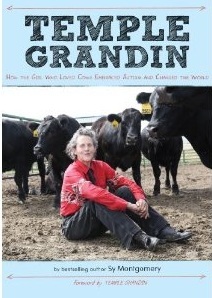 She moves from different periods in Grandin's life to her consultations with the livestock industry, engineering designs and on to explanations of what autism is, differences in brain functions, and how Temple Grandin uses her differences to make animals safe and comfortable. The book moves rapidly and packs in a lot of information, but never feels cluttered or hurried. Most of the chapters begin with a story from Grandin's early life and end with a section on brain development and differences. The book is sprinkled with designs, photographs, and drawings and and ends with Temple's advice for kids on the autism spectrum, extensive bibliography and resources, and index. Verdict: This book isn't just for kids on the autism spectrum, their families, or kids who interact with them. It's for kids who dream of doing something with their life and for those who need a focus and purpose. It's for teachers and librarians who want to inspire kids to make real changes in the world. It's also a fascinating story of one amazing woman and how she found her purpose in life. Recommended. That's about all I have to say...I took off any time I wasn't at a program or on the desk and worked from home. Siiiiiiick. Monday - Staff meeting. The chicks are not hatching! Why? Tuesday - Battle of the Books. The elementary school librarians came Monday night to set up. We spread things out a little since they were badly cramped last year, and we also picked Tuesday when we could use the Community Room instead of the lobby. I let the volunteers and students in early (last year illicit people sneaked in. Tsk. Tsk.) and kept an eye on things until the successful conclusion. The chicks started hatching! I went home early to work on planning storytimes and programming. Wednesday - Only three programs! Phew. Preschool Interactive, Early Head Start visit, and Lego Club. I had promised I'd try some bilingual books on my own for Head Start, although I don't speak Spanish, and it went pretty well although it would have been better if I'd been able to rehearse the books. Preferably with someone who spoke Spanish. Doing titles with just a few Spanish books works better, at least for me, like Senorita Gordita. Only two Headstart families, but there were still some kids from PI who wanted to hear more stories and some late arrivals who were delighted that they hadn't missed storytime after all. More chicks hatched! Friday - Desk in the morning. Then went home. Still feel Siiiiiick. I am reviewing another poetry book! Shocking, isn't it? But this book is so amazing, I just had to review - and have it for our library. Although I put it in picture books, so it won't die a painful death in the 811s. There are more than enough dusty books back there as it is, thank you previous librarian or whoever it was that bought them. First of all, this book is very...structurally satisfying. Forget ebooks on their dinky little screens, this book has heft. It's a nice, thick, weighty square with heavy cardstock pages. It makes me feel like picking up a ream of scrapbooking paper and flipping through it. The reader is immediately greeted with a flock of birds and a "this book belongs to " spread, making this a good present. Then we have a close-up of one of the birds on the title page and then a plunge into color on the table of contents. The poems are divided into seasons, spring, summer, autumn, and winter with 12-18 poems per section. Each season has a brief introduction and then, into the poems! All the poems include some kind of information about a natural phenomena or creature. There is a variety of styles and formats, as varied as the stunning art. All the poems make great read-alouds and you could easily start at the beginning and work your way straight through the 100 pages. Or dip and nibble, try one season at a time, or a sample from each season. Ration yourself to one poem a day or gulp them all at once! The poems cover nature in the city, at the beach, on the farm, at night, in the rain, in the snow. Little surprises are popped in - five reasons chickens are funny, a recipe for berry crumble, how to build your own den. The book ends with instructions on saving seeds and feeding birds. And then the artwork...I desperately wish I knew enough about art to explain why this art is so lovely! Happily, Seven Impossible Things can do that for me. I will just say that it is robust and colorful, beautiful without being trite, and endlessly inventive and appreciative and the beauty of nature with a running theme of birds. Verdict: I have bought perhaps one poetry book a year for the past four years so when I say buy this, you know it's exceptional! I'm even going to buy a copy for myself sometime, it's just that lovely. A rollicking rhythm and exuberant, large-scale illustrations make this a delightful addition to any storytime. I read it quite a while ago and immediately added it to my order list. Then it got bumped off, then it got added on again...and so it goes. I finally ended up purchasing a copy last month and I've been trading it back and forth with Miss Pattie for use in toddler and preschool storytimes every since. 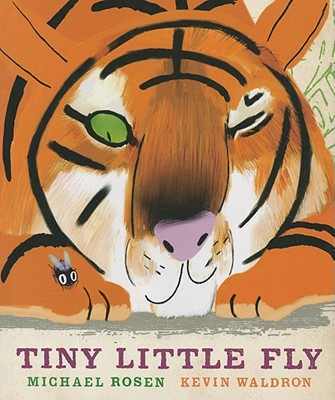 A tiny little fly, a plump black ink smear with big eyes, is zipping along, "My, oh my,/Tiny Little Fly!" he sees an elephant, takes a seat on the elephants trunk and "Great Big Elephant/winks one eye,/says to himself,/'I'm going to catch that fly!" but after some noisy tramping and crushing, away zips the fly. Hippo and Tiger try as well, but just end up in a muddy mess on a huge fold-out spread and Tiny Little Fly swoops off on his way. The ringing cadences of the rhymes and repetitive refrains make this a great story to read over and over again until your listeners can chant along with you. Michael Rosen (when he's not writing extremely depressing books for children about death) knows just how to catch a child's ear with his brisk text. Waldron's art is bold and exuberant, with smashing elephant legs, rolling hippos, and swatting tigers. This book is appeals to sight and touch, with thick pages that look like brown recycled paper, swashes of browns and dabs of color, and background patterns faint enough to interest readers in looking color. Throughout it all, Tiny Little Fly athletically zips, avoiding every danger and coming out on top, despite her tiny size compared to the massive jungle creatures. Verdict: I don't know how we survived without this book so long. How are you surviving without it? Go forth and purchase.